A very variable and versatile species, Eucalyptus gunnii is commonly called the Cider Gum. This is a plant that can reach great heights, however is usually grown as a smaller tree or shrubby tree. With very attractive rounded juvenile foliage the plant is very popular with florists as a backing plant. The common name of Cider Gum comes from the sap which is sweet and can be fermented. This species is from Tasmania, and it grows very well in cold climates. In most cases it is copiced so that it maintains the rounded juvenile foliage rather than the elongated mature foliage. 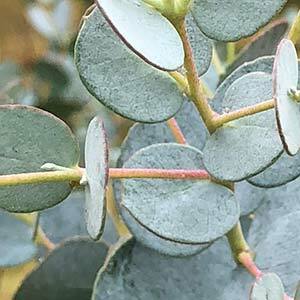 This is an excellent Eucalyptus for cold climates and wet soils. It is remarkably tolerant. Once established it requires very little care, and the decision to prune depends on how you want the tree to look. Like Eucalyptus latens Moon Lagoon, it is usually coppiced if grown for the foliage. If grown as a small tree it is not pruned. It grows well in the UK as well as through Europe where it is grown both for the foliage as well as a wood lot tree. Soil – Well drained to moist. This species will tolerate periods of wet or boggy soils. Foliage – A good blue/green rounded foliage reverting to elongated with age. Flowers – Creamy white in winter to spring. Spread – Will spread to form a crown around 5 metres. Again less when copied.